Welcome to Midtown, the center of many visitors' trips to New York City. The beautifully restored Grand Central Terminal is here and paces away from the Chrysler Building, the United Nations complex, Rockefeller Center, St. Patrick's Cathedral, and Trump Tower. This is also where you'll find the fascinating and awesome New York Public Library which has changing exhibits. Behind the public library is the lovely Bryant Park, which hosts Broadway Under the Stars, free movies and music events in summer. And what says New York better than Fifth Avenue stores? 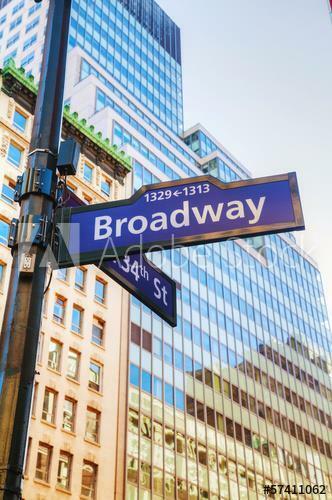 Midtown also includes the new, revitalized Times Square and the Theater District, where world-famous Broadway productions wow audiences nightly. Midtown is separated as Midtown East and Midtown West. The town is home to a high percentage of the city's skyscrapers. The Museum of Television & Radio is in midtown as is the Intrepid Sea-Air-Space Museum, the American Craft Museum, Carnegie Hall, the Museum of Modern Art and Radio City Music Hall is a neighborhood in New York City that has such world-famous commercial buildings as Rockefeller Center, Radio City Music Hall, and the Empire State Building. The exact size of the Midtown area is disputed. Most agree that the core commercial area extends from 42nd Street up to the southern edge of Central Park on 59th Street and from Third Avenue in the east to Ninth Avenue in the west, but some take a broader view and classify Midtown as the whole area of Manhattan in the 30s, 40s, and 50s between the Hudson and East Rivers. 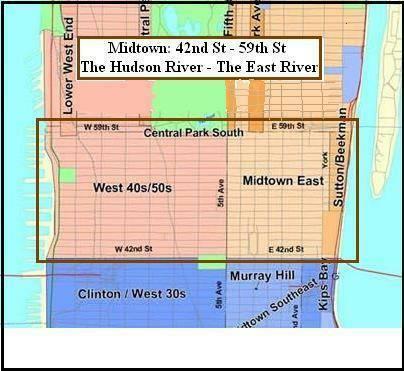 Midtown is sometimes broken into "Midtown East" and "Midtown West" or into more traditional neighborhood distinctions like Turtle Bay, Murray Hill, Kips Bay, Hell's Kitchen, Clinton, and others. Whatever its boundaries, Midtown Manhattan is indisputably the busiest single commercial district in the United States. The great majority of the city's skyscrapers, including most of its hotels and many apartment towers are within Midtown. More than three million commuters work in its offices, hotels, and retail establishments; the area also hosts many tourists, visiting residents, and students. Some areas, especially Times Square and Fifth Avenue, have massive clusters of retail establishments. The Diamond District on 47th Street has been made famous throughout the world and is home to tens of thousands of fine jewels.